After the installation of the new Windows Server version (Windows Server 2012 RC) it was annoying for me that the “Server Manager” started every time when I logged in to the machine. Select “Manage” on the top bar. 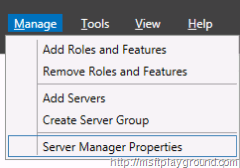 Select “Server Manager Properties” from the drop down menu. Select the option “Do not start Server Manager automatically at logon”. Thank you very much. I also can’t find it. Windows 8/2012 is a big fail! Tank you. I don’t think Windows 8/2012 is a big fail! The option is just hard to find. exampal: teaming intel nic and tp link nic…. Thanks – that solved a real annoyance. I agree with the ‘big fail’ – as far as I can tell the main difference with the new O/S is that they’ve found new places and ways to hide things. Having to do google searches to find the new hiding place is just a waste of time. Why they think Server Manager is required at logon to begin with is a mystery, but the most obvious thing on the page should be how to stop the behavior – instead they bury it. Generally I’m a little suspicious that this is a little like your waiter spitting in your food; i.e. they don’t like the users (we complain) so they’re doing it out of spite. I don’t find anything that’s ‘easier’ in the new OS; in general things that used to take one or two mouse clicks now takes three or six. Thanks for the info. It would have been nice if MS just put the check box to disable this on the first page as they did in previous versions of the OS. Great you find another solution. It is really strange that the option is set back every time. Maybe it is defined in a group policy or are you using other user profiles? Because the option is user profile related. Yeh, it’s strange it doesn’t work by deselecting the option. I checked and there’s no GPO for it. I checked and by disabling the Task Scheduler for “ServerManager” it stops it for other admins as well which is quite handy for other admins that log onto the server. That very strange, I will keep your solution in mind If I ever encounter the problem. Agree with Christof. When someone with 20+ years experience on Windows systems has to google to find out how to shut the system down, find the control panel, etc etc etc, it isn’t anything but a step backwards. One of the main things that people (used to) find appealing about a new version of windows was all the new features that were overlaid on top of the familiar interface. What has the homogenisation of applications over the last 20years proven? That people will stick with the MS brand because it’s familiar and the interface is virtually the same across the WHOLE suite of applications. This is a corporate advantage now lost to Microsoft. Whoever made the decision to radically change the user interface ought to be sacked. Why the Server Manager needs to be shown on every start, eating resources needlessly is an absolute mystery. The fact that you then tick the box to say “don’t come back” and it comes back is nigh on ludicrous. Thanks for the instructions. I agree with everyone else who is frustrated with the new interface; simple things we are used to doing, now require extra steps, or we have to do a search to find out where they hid something (which is exactly how I ended up on this page). I felt the same as you do about the learning curve since they moved things around or how to open or use certain tools. I figured it out as I am sure you all did as well, but here is something that would make the changes near irrelevant. Try the following, hold down your Window’s Key and press X simultaneously. This will pull up a sub menu where the start menu would normally pop up, except it also has all the useful tools you all having been complaining and is not related to the start menu and is about going a different route due to their unwise changes. They will then appear like they did in Server 2008 R2. Here are the choices from bottom to top or close. Computer Management, Desktop, Run, File Search, Control Panel, Task Manager, Command Prompt (elevated too), disk and device management, System, Event Viewer, Programs and Features, Power, and one of the handiest in my opinion, Shutdown, restart, and logoff. You can quickly restart by holding Window’s key+X then press U twice and enter unless you want to specify why you are shutting down or rebooting. Same for reboot except instead of two U’s, you would perform Win+X then U, then R then enter or space, again unless you want to specify planned, unplanned, or whatever. As a side note: I discovered this because I learned how to get the run line to open for Windows 7/8 when fixing another users system rather than go into the task manager properties and checking the box to show run. Try using this by holding down the Window’s key and pressing R. There are many other shortcuts within Windows and Server including in applications and they make navigating and the process so much more efficient once you become accustomed to using them. This also works on Windows 8.1, 10, but not Windows 7 or earlier. I assume it works in Windows 8.0, but I haven’t personally checked. Feel free to email me with any questions, issues, or critique.